The first ARDUINO EDUCATION CONFERENCE in Singapore was held at the Singapore Science Centre in collaboration with Duck Learning, on 23 and 24 August. We were honored to have keynote Speaker David Cuartielles, co founder of Arduino share his insights and have an open discussion with educators on the full potential of Arduino Education technologies. Over 100 participants joined us in this 2 days conference and tried their hands on the different projects using the Arduino Starter Kit. This experience allowed participants to explore the possibilities that Arduino can add into their curriculum and the innovative ways Arduino can be used for various purposes! Thank you to all participants who joined us in this event and we hope to bring more similar seminars and conferences to you in the near future! Test your coding skills and take part in the first ever KUBO Challenge at Tech Saturday 2018. Organized in collaboration with IMDA Singapore, Duck Learning hopes to introduce coding to young children with the first ever KUBO Challenge! What is the KUBO Challenge about? The KUBO challenge encourages free tinkering and self-directed learning among young children aged 4 to 10. This challenge encompasses a maze with obstacles where students will conceptualize the best way to accomplish the task given with KUBO Robot with a TagTile™ system that provides new ways to learn to code intuitively. Yes, it’s so intuitive such that participants are not required to have prior coding experience at all! Come join us for this fun and engaging challenge that will incorporate the 4Cs of 21st-century learning – Communication, Collaboration, Creativity and Critical thinking in your child. Do I need to have any coding experience? Not at all! This challenge is so intuitive that you can learn to code and complete the challenge on the spot. Absolutely nothing. Just form a team of 2 with at least 1 child aged 4-9 in your team, register your team and be present at Tech Saturday. Type of teams: For schools, a team of 2 participants aged 4 to 9. For the public, a team of 3 participants with at least 1 child aged 4 to 9. The top 3 teams from each category will walk away with attractive prizes. We highly encourage an adult, the parents, an older sibling or cousin or even the grandparents to join in this challenge for the Public Category. Learn to code together with your child or grandchild. It’s that simple, even a grandparent can do it! Join us at Suntec City Convention Hall 403 & 404 on 3rd June 2018 for an enriching learning experience! Check out what KUBO can do here and how it helps children develop holistically in terms of imparting STEM knowledge at a young age, while at the same time motivate independence and critical thinking abilities. KUBO Robotics offers a simple, intuitive plug-and-learn solution with low complexity and easy adoption. The unique hands-on TagTile™ system provides new ways to learn coding, with broad curriculum relevance to maximize learning outcomes. KUBO is suitable for students aged four to ten and does not require any prior knowledge of coding. It is interactive and fun and allows for kinesthetic learning without the use of screen time. The National Junior Robotics Competition is an exciting and unique event organised annually by Science Centre Singapore. This robotics competition encourages students to develop problem solving skills, entrepreneurial skills, creative thinking skills and team spirit among participants. NJRC is about celebrating the process of learning through interactive, meaningful experiences. Science Centre is pleased to announce the first iteration of the revamped competition “National Robotics Competition” (NRC). The relaunch hoped to reach out to students from all levels in the Education spectrum and to also engage the public on the importance of Robotics and STEM education for our younger generation. Among the changes are a category for students between 6-8 years of age, a robotic arm hackathon and a category in which science and robotics come together in a very realistic manner! The competition was held from 4 – 8 Sep 2017 during the September school holidays. Duck Learning also had an interactive booth where we showcased our products and solutions. Day 1 & 2 of the National Robotics Competition begin with the WRO Primary category with over 120 teams taking part and participants aged between 9 to 12 years old. Introduction Primary Category: The mission of the robot is to bring Scientists and Visitors from the Start Area to the Scientist and Visitor Areas (S&V’s). The robot must also move an endangered animal discovered in an S&V to the adjacent rainforest (the green Endangered Species Areas) or to the adjacent ocean (the blue Endangered Species Areas). The mission is completed when the robot is within the Finish Area. With about 20 teams taking part in the challenge for the first time, we were very excited to debut Duck Learning’s very own Junior Challenge, a mission-based challenge to be completed by a robot built from LEGO Education WeDo 2.0. The Jr. Challenge was debut on the second day of NRC. For Day 3 & Day 4 of the National Robotics Competition, teams are from Secondary & Tertiary, competing in the WRO Challenge. The WRO Secondary category had over 120 participating teams and the Tertiary category had close to 30 teams taking part in the challenge. Introduction Secondary Category: Greenhouse gases, such as carbon dioxide, emitted by human activities like transportation, industrial processes, and energy production affect the temperature of our planet. The Challenge is to make a robot that can help one company reach carbon neutrality. To accomplish this, the robot must install renewable energy sources, like solar panels, and plant trees to counterbalance the emissions from the industrial processes of the company. Introduction Tertiary Category: The demand for electricity is increasing every day. More facilities like wind farms that generate electricity from renewable and clean energy sources are needed. The Challenge is to make a robot that helps to build a wind farm. The robot will select the best places to build the different wind generators of the wind farm in order to ensure maximum efficiency from the generators and no impact on the environment. The final day of NRC held the WRO Open category, Science Automatica and Robot Arm (Open and Advanced). The finale of the National Robotics Competition 2017 was the awards ceremony. The Guest of Honor, Mr. Johan, Managing Director of ABB Singapore and Prof Lim, CE of Science Centre closed this year’s National Robotics Competition 2017. Duck Learning is proud to be able to support this event. Code for Fun Enrichment Programme (done jointly by IDA and MOE) is offered to all MOE primary and secondary schools to increase students’ exposure to coding and computational thinking. Fees for students’ training and purchase of education kits under the programme are heavily subsidised by IDA (up to 70% for students training and 50% for education kits). Please download the application form for more details. Duck Learning is proud to present our program for the Code for Fun Enrichment program using LEGO Education WeDo. 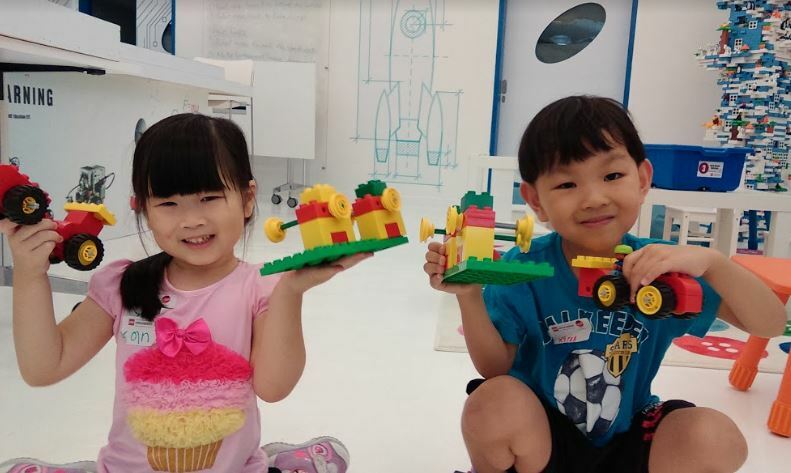 FIRST® LEGO® League (FLL) is an international enquiry-based programme teaching students ages 9 through Print16 about science, technology and collaborative working. FLL® is a partnership between the non-profit organisation FIRST® (For Inspiration and Recognition of Science and Technology) and the LEGO® Group. It had its first season in 1998. Now over 230,000 students from 80 countries take part. Impact studies show that students gain an increased interest in science and technology by working with FLL®. FLL® does this by providing a practical and engaging way of involving students in the subject areas.